Scooter Crazy Ltd now brings you the most comprehensive range of scooter and motorbike helmets with FREE delivery throughout mainland UK on orders over £75! 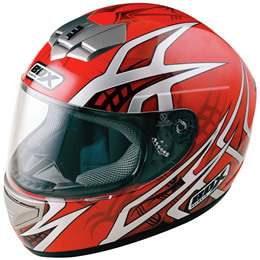 We supply a wide selection of helmets including open face helmets, full face, flip-front helmets and off-road/moto cross. We stock a well known selection of designer brands including Momo Design helmets, Vespa helmets, Nexx, KBC, Carnaby Design and HJC to name a few. These motorcycle and scooter helmets are synonymous with quality, safety and innovation. 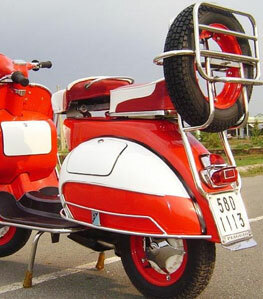 The name speaks for itself, outstanding in both safety and style, and essential for any die hard Vespa fan. With quality hypo-allergenic Terinda lining and leather and chrome finishing touches. New colours are brought out each year to match the latest models and colour trends and a Vespa helmet really is the perfect accompaniment to and Vespa scooter. Bell helmets have played a vital role in ensuring riders safety for the last fifty years. 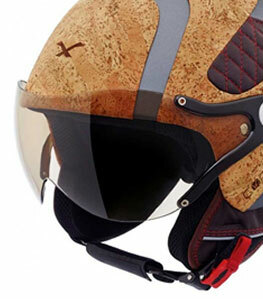 Their designs are stylish and incredibly retro, with many helmets being replicas of their original designs. All are ECE22.05 and ACU gold standard approved, offering the very best in head protection, with bonus features such as sweat resistant liners and ultra light construction. Furthermore, all helmets that have been tested so far have received the highest 5 star rating by Sharp. Nexx have attempted to think of every possible customer when designing their collection of scooter and motorcycle helmets and we think they've done a pretty good job. Bright bold colours to more contemporary vintage styles in the open face helmets and ultra light top of the range carbon full face helmets alongside a childrens helmet range which crosses over for adults who require smaller sized helmets. From true fashion stylists Momo Design, a classical high end range of open face helmets with safety, luxury, style and comfort in mind. Every single piece in the collection oozes sophistication and all styles have mid and top helmets with carbon fibre and chrome options. Ideal for those on a budget but still looking for a sound, quality helmet. All Box helmets are ECE22.05 approved so you can be assured of their safety as well as their quality. With stylish graphics, ventilation systems, removable linings and lightweight shells. As well as a fantastic range of scooter and motorbike helmets, Scooter Crazy also offer a selection of accessories to compliment them. The selection includes helmet stands to ensure your helmet isn't damaged when removed, tinted visors to block out the blaring sunshine (when we get it), helmet bags to make it easier to transport your helmet when off the scooter, face masks and collars to keep you snug and warm in winter and goggles to protect your eyes from giant flying bugs (you know the ones we mean!). Although most helmet manufacturers use the same size guidelines there can be slight variations between fittings. Please ensure you measure your head correctly before placing your helmet order and if you have any queries please feel free to call us on 01226 203377 or email us. Should you receive your helmet and it does not fit we are more than happy to exchange it for a different size. Please see our terms and conditions for details on how to return goods.